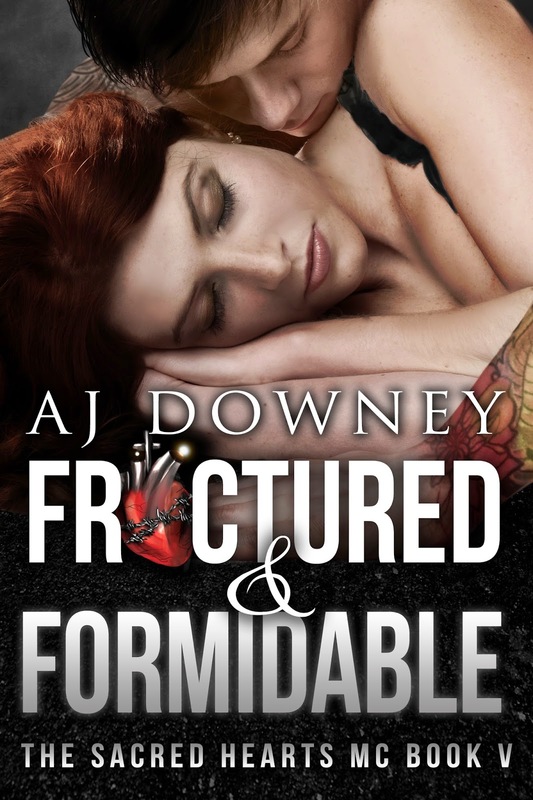 Fractured & Formidable Cover Reveal! Mandy Price is best friends with Everett, the Ol’ Lady to the Sacred Heart’s VP, and roommates with them both… No one would guess that the preacher’s daughter could have such a dark secret, but Mandy had a big one. The product of a broken childhood, Mandy lives a fractured existence. She maintains the outward appearance of normalcy, that everything is just fine, when nothing could be further from the truth. Ever the dutiful daughter, she returns to her father’s church and his table every Sunday. Trouble is, things are growing worse not better as Mandy grows into her own. It’s becoming harder and harder to maintain appearances on a daily basis and Mandy is definitely feeling the strain. Revelator has had his eye on the innocent redhead from the moment he first saw her. Too much has been getting in the way of him pursuing the angel, prospecting for the club taking up just too damned much of his time. He was fully patched now, still, just when he was getting ready to make a move, that’s when his shop came down around his ears. Faced with rebuilding from the ground up, he’s decided that if he has to start from the beginning, he might as well go all in. If starting over is what has to happen then the life he plans on building from here on out definitely has his Red by his side and no one else’s. A.J. Downey here, with a very special announcement concerning Fractured & Formidable, the fifth installment of my Sacred Hearts MC series. In my travels and research as an MC romance author I’ve come across some interesting stories and even more interesting groups and organizations. One such group, B.A.C.A or Bikers Against Child Abuse partially inspired the story for Fractured & Formidable with their good works. That being said, I will be donating half of all pre-order and first month’s sales of Fractured & Formidable to my local B.A.C.A. Lake Washington Chapter which serves the greater Seattle Area. I am not raising the price of Fractured & Formidable in any way, if you are buying my series for the love of my series, all you have to do to support this wonderful cause is one click the title as soon as it goes on preorder or in the first month of its release. That’s it. Thank each and every one of you for reading, and thank you even more for your support in this wonderful cause.